27 July 1912-30 September 1919: Fahnenjunker, Battery Officer, Battery Leader and Adjutant in the 2. Unter-Elsässisches Feld-Artillerie-Regiment Nr.67 as well as Adjutant of Artillery Commander 52. 1 October 1919-30 September 1920: Battery Officer in Light Reichswehr Artillery Regiment 13 (later redesignated Reichswehr Artillery Regiment 13) of Reichswehr-Brigade 13. 1 October 1920-30 September 1924: Battery Officer in the 5th Artillery Regiment upon the formation of the new Reichsheer from the Übergangsheer or Transitional Army. 1 October 1924-30 September 1925: Leader Assistant training with the staff of Wehrkreis [Military District] Command V, Stuttgart. 1 October 1925-30 September 1926: Transferred to the staff of the 5th Division. 1 October 1926-30 September 1927: Transferred to the Army Organization Department (T 2) of the Troop Office/Reich Defense Ministry. 1 October 1927-30 September 1928: Transferred to the staff of the II. Battalion of the 5th Artillery Regiment. 1 October 1928-30 September 1929: Squadron Chief in the 5th Transport Battalion. 1 October 1929-30 September 1930: Hauptmann on the Staff of the 5th Artillery Regiment. 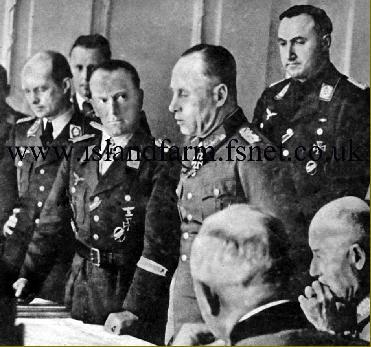 1 October 1931-14 September 1933: Hauptmann on the Staff of the 5th Artillery Regiment. 15 September 1933-14 October 1935: Tactics Instructor at the Artillery School at Jüterbog. 15 October 1935-9 November 1938: Commander of the I. Battalion of Artillery Regiment 5 of the 5th Infantry Division. 10 August 1940-31 October 1940: Leader Reserve – placed at the disposal of the Commander of Wehrkreis Command XVIII, Salzburg. 10 August 1940-31 August 1940: At the same time, detached to the service of the Luftwaffe Parachute Troops. 1 November 1940: Transferred from the Army to the Luftwaffe. 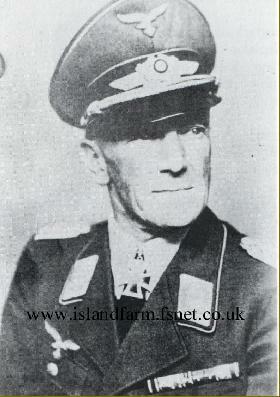 1 September 1940-25 February 1942: Commander of Parachute Air Landing Assault Regiment 1 (Assault Regiment “Meindl”). 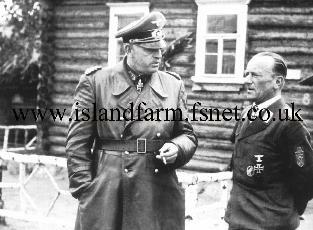 Generalmajor Eugen Meindl (right), the Commander of Division “Meindl,” in conversation with Generaloberst Ernst Busch, the Commander-in-Chief of the 16th Army, in northern Russia, 1942. Note the Narvik Shield on Meindl’s left arm. 1 October 1942-15 June 1943: At the same time, Commanding General of the I Luftwaffe Field Corps (corps never actually formed; continued to be listed as the XIII. Flieger-Korps on German orders of battle). 15 June 1943-20 July 1943: At the same time, detached to the Reich Air Ministry/L In 18. 21 July 1943-4 November 1943: At the same time, Inspector of the Luftwaffe Field Formations (L In 18)/Reich Air Ministry. Generalfeldmarschall Erwin Rommel, the commander-in-chief of Army Group B, visiting the headquarters of the II. Fallschirm-Korps in France, 1944. (Note his Luftwaffe Parachutist Badge), Meindl’s chief of staff. 25 May 1945-29 September 1947: Prisoner of war. Knight’s Cross of the Iron Cross: 14 June 1941, Generalmajor, Commander of Parachute Air Landing Assault Regiment 1. Oakleaves (No. 564): 31 August 1944, General der Fallschirmtruppe, Commanding General of the II. Fallschirm-Korps. Swords (No. 155): 8 May 1945, General der Fallschirmtruppe, Commanding General of the II. Fallschirm-Korps. Prussian Iron Cross, 1st Class (1914): 17 January 1916. Prussian Iron Cross, 2nd Class (1914): 18 July 1915. 1939 Bar to the Prussian Iron Cross, 1st Class: 10 June 1940. 1939 Bar to the Prussian Iron Cross, 2nd Class: 22 October 1939. Medal for the Winter Campaign in Russia 1941/1942 (“East Medal”): 9 August 1942. Wound Badge in Black – World War II award: 25 October 1941. Narvik Shield: 10 November 1940. “KRETA” Campaign Cuff-Title: 25 May 1943. Kindly convey to your father exactly what I’m going to say to you. The time has come when Normandy can no longer be held. It cannot be held because the troops are exhausted. This is the fault mainly of orders to hold out in hopeless positions; but we are still being ordered to hold out even now. The enemy will break through to the west of us and outflank us. If your father knew what it means to operate against an enemy with a downright fabulous command of the air, then he would know that our only chance of doing anything useful at all is by attacking at night. Tomorrow’s tank attack is going to be a failure…and all that’s left for the grenadiers to do is to lie down and sacrifice their lives. It’s heartbreaking to have to stand by and watch! Meindl’s prediction proved accurate. The already depleted panzer divisions launched their daylight counterattack (Operation “Lüttich”) against stubborn U.S. resistance at Mortain and under the full weight of the overwhelming Allied tactical air forces. After penetrating about five miles, the mauled panzer divisions ran out of fuel. Rather than retreat, Adolf Hitler once again ordered the Army to hold its dangerously exposed positions—an order that led to the encirclement and virtual destruction of two German armies in the Falaise Pocket. With the German 5th Panzer Army and 7th Army almost completely encircled between the advancing American and Anglo-Canadian-Polish forces, the remnants of Meindl’s corps desperately held open a narrow corridor that allowed thousands of German troops to escape. On the night of 19-20 August 1944, Meindl and his chief of staff, Oberst Ernst Blauensteiner, each led an assault group formed from the remnants of the 3rd Fallschirmjäger Division, the 7th Army staff and a few Waffen-SS tanks in a last chance bid to escape from the Falaise Pocket. After a desperate march through enemy-controlled territory, Meindl’s depleted battle group finally broke free of the encirclement. 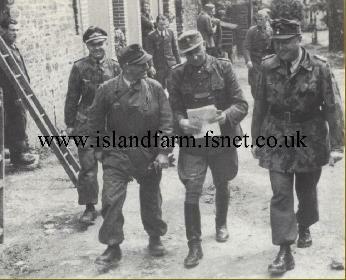 The first photo depicts three senior German commanders during the Normandy Campaign in the summer of 1944. General der Fallschirmtruppe Eugen Meindl, Commanding General of II. Fallschirm-Korps. Badsey, Stephen. Osprey Campaign 24: Arnhem 1944 – Operation ‘Market Garden’. Osprey Publishing Ltd., Oxford, United Kingdom, 1993. Carell, Paul. Invasion—They’re Coming! Ewald Osers, translator. Bantam Books, New York, New York, 1984 printing. Hildebrand, Karl-Friedrich. Die Generale der Deutschen Luftwaffe, 1935-1945, Band 2 (Habermehl-Nuber). Biblio Verlag, Osnabrück, Germany, 1991. Kaltenegger, Roland. Krieg amd Eismeer: Gebirgsjäger im Kampf um Narvik, Murmansk und die Murmanbahn. Leopold Stocker Verlag, Graz, Austria, 1999. Munoz, Antonio J. Göring’s Grenadiers: The Luftwaffe Field Divisions, 1942-1945. Axis Europa Books, Bayside, New York, 2002. Pallud, Jean Paul. “Operation Merkur: The German Invasion of Crete,” After the Battle, Number 47 (1985), pp. 1-31. Whitley, M.J. Destroyer! German Destroyers in World War II. The Naval Institute Press, Annapolis, Maryland, 1983. On 10 April 1940, five British destroyers of the 2d Destroyer Flotilla (Captain Bernard A.W. Warburton-Lee) entered Narvik harbor and, in the ensuing battle sank two of the German destroyers and damaged three others. Kommodore Bonte was killed in action when his destroyer, the Wilhelm Heidkamp (Z 21), was sunk during the action. The British lost two destroyers in the battle including the HMS Hardy aboard which Captain Warburton-Lee lost his life (posthumously awarded the Victoria Cross). On 13 April 1940, the remaining German destroyers were sunk at Narvik by the British battleship HMS Warspite (Vice-Admiral W.J. Whitworth) supported by nine destroyers and aircraft. Fregattenkapitän Erich Bey, who took command of the destroyers at Narvik from the fallen Bonte, fought a defensive action during which the Germans severely damaged two of the British destroyers and caused one to go aground. After expending their remaining ammunition, Bey ordered his surviving destroyers to beach themselves in the Rombaksfjord. In December 1942, Division “Meindl” was reorganized and redesignated the 21st Luftwaffe Field Division. To make good manpower losses incurred on the Eastern Front, 22 field divisions were formed from surplus Luftwaffe personnel beginning in September 1942. Initially remaining under Luftwaffe administrative control, the field divisions generally suffered from poor training and morale as well as shortages of equipment, artillery and vehicles. Although originally intended for service in quiet sectors of the front and occupation duties, the troops of the Luftwaffe field divisions often found themselves in the thick of combat. Ill-suited for frontline service against veteran Russian troops, the Luftwaffe divisions more often than not collapsed when on the receiving end of an attack. Effective 1 November 1943, the surviving Luftwaffe field divisions were transferred to Army control. Numerous divisions and elements thereof would ultimately pass in and out of II. Fallschirm-Korps control during the Normandy campaign. The 5th Fallschirmjäger-Division was initially held in 7th Army reserve before being committed to battle under the LXXXIV Army Corps on the left flank of the II. Fallschirm-Korps. On 12 June 1944, Meindl briefly assumed leadership of the LXXXIV Army Corps following the death of General der Artillerie Erich Marcks in an air attack near Carentan. Arriving the next day, General der Artillerie Wilhelm Fahrmbacher took command of the corps. On 4 November 1944, General der Fallschirmtruppe Alfred Schlemm replaced Generaloberst Student as commander-in-chief of the 1. Fallschirm-Armee. Both Student and Schlemm were later held as prisoners of war at Island Farm Special Camp 11. On 20 August 1944, Generalleutnant Dipl. Ing. Richard Schimpf, the commander of the 3rd Fallschirmjäger Division, was severely wounded in the leg during the breakout from the Falaise Pocket. He remained hospitalized and in convalescence until 6 January 1945 when he resumed command of the division.